The Tvan is one of the most popular camper tourers ever produced. And constant innovation and improvement has ensured that the much-loved unit will stay a favourite for many years to come. What we looking at here is the latest version of the Tvan Mk4, an incredibly practical, compact and user-friendly camper built to high engineering standards, which first entered the scene 18 years ago. The Murranji specification is the flagship of the Tvan Mk4 range and its packaging has been improved yet again with a host of new optional equipment combining with the impressive standard features. 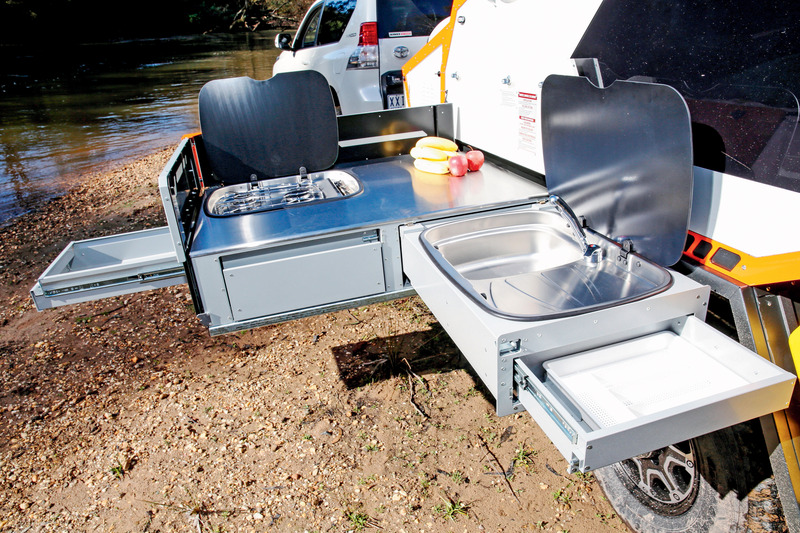 When CTA summarised the Tvan Murranji following its performance at the CTA Camper Trailer Of The Year 2015 awards, we wrote: “This Aussie camping legend proves it has still got what it takes to stay ahead of the pack.” This time, I’ll say that as the pack gets bigger and starts snapping at its heels, the Murranji sprints ahead, loaded to take it on! Who could possibly fault the solid overall construction of the Tvan? It has a DO35 offroad coupling out front of the A-frame drawbar featuring plenty of reversing clearance. There’s a handbrake for the upgraded 12in electric brakes, and two 4kg gas cylinders covered by rip-stop vinyl. You could easily repaint the removable alloy stoneguards to keep up the appealing aesthetics. There’s a pair of storage containers for muddy gear and the spare wheel sits on the roof with easy access. The spare also serves as overhead protection from whipping saplings, particularly with the Perspex skylights behind. Both have flyscreen and awnings, plus they open for flow through ventilation. The tent is stowed in the rear hatch, keeping the full camper-queen bed clean and dry. Access to the bed is as simple as unlocking four over-centre catches, folding down the deck and releasing the gas strut-assisted hatch. You might then choose to shut the hatch after yourself and go straight to bed, or to install one of the two rear-door covers. 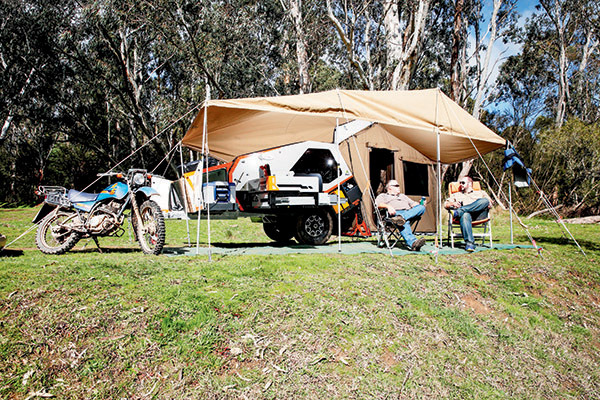 The rear insect screen now included in the Murranji is ideal for tropical weather as it’s made from sand fly-proof mesh and allows maximum airflow. We chose to set up the rear tent and annexe instead, which erects in a jiffy. The premium tent is standard on the Murranji and is made from Coolabah poly/cotton 8oz super-fine weave Japara canvas by Wax Converters with midge-proof mesh and YKK zips. Fitted with a tropical roof, it is cosy when closed, and light and airy when the three large windows and doors are unzipped. I really liked the ‘breakfast bar’, a shelf that tensions the end wall and ensures full head height right to the edges. There’s even a zip-on ensuite tent included. Check out the new and very ingenious plug-in flick mixer fitting, which adjusts the shower temperature. As usual, the full-length awning takes the longest to assemble, probably around 15 minutes. It’s worth it in the heat or inclement weather but I wouldn’t bother for a simple overnight stop on a long journey. There’s something really comforting about sleeping with a solid roof overhead particularly in tropical downpours or at the opposite extreme snow. For added comfort, there’s a pair of three-speed fans, a tonne of internal storage and optional sliding side windows. Under the bed we also find two all-new sheet metal storage tubs, which look great and are available as a set of three or can be purchased as singles. Designed to work around the new air-conditioning and other options under the bed, these tubs are completely removable for easier loading and lock securely in place when travelling. 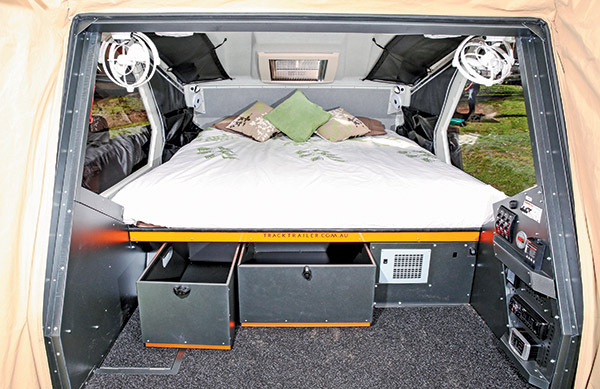 The drop-down floor and rear-opening hatch set the Tvan apart and make for a very flexible camping setup, whether you want to deploy the tent or not. With a little practice you’ll do it easily in four or five minutes. The Mk4 Murranji package includes the full-length annexe and zip-on ensuite as standard. The updated Premium Kitchen standard on the Murranji includes a locker that’s 30 per cent larger and twice the bench space of its smaller counterpart, the Classic. There’s a beautifully formed stainless steel benchtop for a premium feel and more powder-coated weight-saving aluminium in the carcass, encasing many drawers for all your kitchen needs. It also boasts a Thetford three-burner glass-topped stainless steel cooktop with piezo ignition and matching stainless steel sink with flick-style tap, draining board and cutlery drawer. Opening it out with one hand’s a cinch, thanks to Track Trailer’s own design of ball bearing runners and slides. The integrated windshields are quite innovative and easily pop up into position, too. There’s even a convenient bottle opener – a very welcome touch in my book! 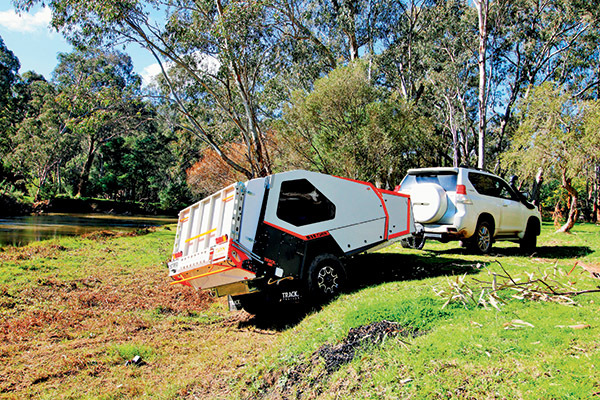 The Tvan is one of the most successful camper trailers in Australian history. Its quality and reputation is unquestionable. The military-designed MC2 suspension is still a favourite after all these years and the resale value is terrific. The Tvan is an ideal companion to a travelling couple; just ask the multitude of happy owners you see once you leave the concrete jungle.